Founded in 1920, by the year 2016, AMC had grown to a chain that included 346 locations across America. At Cards2Cash, we know how expensive an evening at the movies can be! With a discounted AMC Theatres gift card, you can catch the latest films without paying an arm and a leg. Whether you’re looking to enjoy an Imax presentation, RealD 3D, or the comforts of reclining stadium style seating, an AMC Theatres gift card will get you more value for the dollar. For further savings, you can join the AMC reward program to receive $5.00 off for every 5,000 points you earn. Finally, you can have a night out, without blowing your budget! You can use your discounted AMC Theatres gift card at a dine-in theater and enjoy a movie along with a meal. With a menu that offers fries, nachos, wings, flatbread, chicken strips, hamburgers, hot dogs, smoothies, and more, you are sure to be satisfied! For added convenience, you can purchase your tickets in advance, so you won’t have to wait at the door. 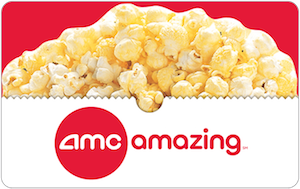 Purchase a discounted AMC Theatres gift card and let the savings begin! Your gift card will stretch your dollar further, giving you more value for your money. But the savings don’t end there, Cards2Cash offers a variety of gift cards for all your shopping and dining needs. We have Cinema Cafe, Regal Cinema, Fandango, and more cards. With Cards2Cash, a night at the movies is affordable! Looking to Sell your AMC Gift Card? Do you have an AMC gift card you aren’t going to use? Cards2Cash will turn that unwanted card into money! We buy gift cards for most nationally known retailers, including restaurants, stores, and websites! If interested, visit one of our retail locations, and we’ll pay you for your unwanted card, OR you fill out our easy online form, and we’ll get back to you with an offer you won’t want to refuse. Whether buying or selling a gift card, Cards2Cash is your one-stop gift card shop!